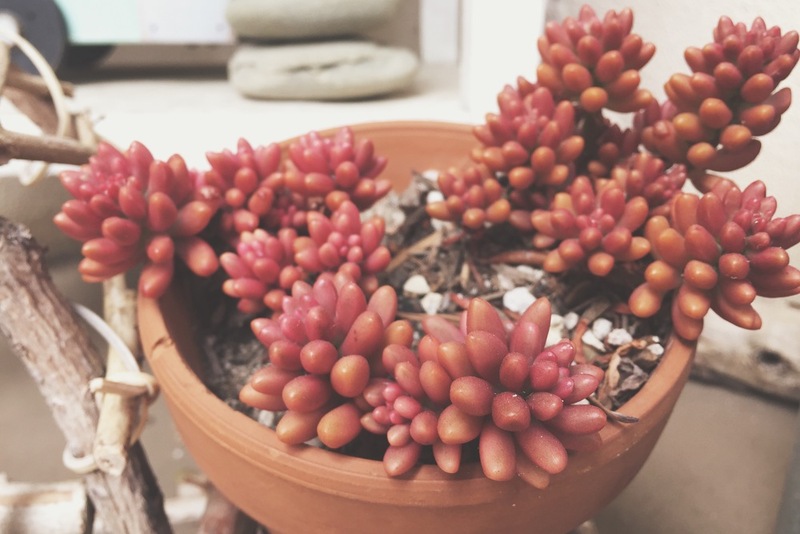 This summer was all about growth. 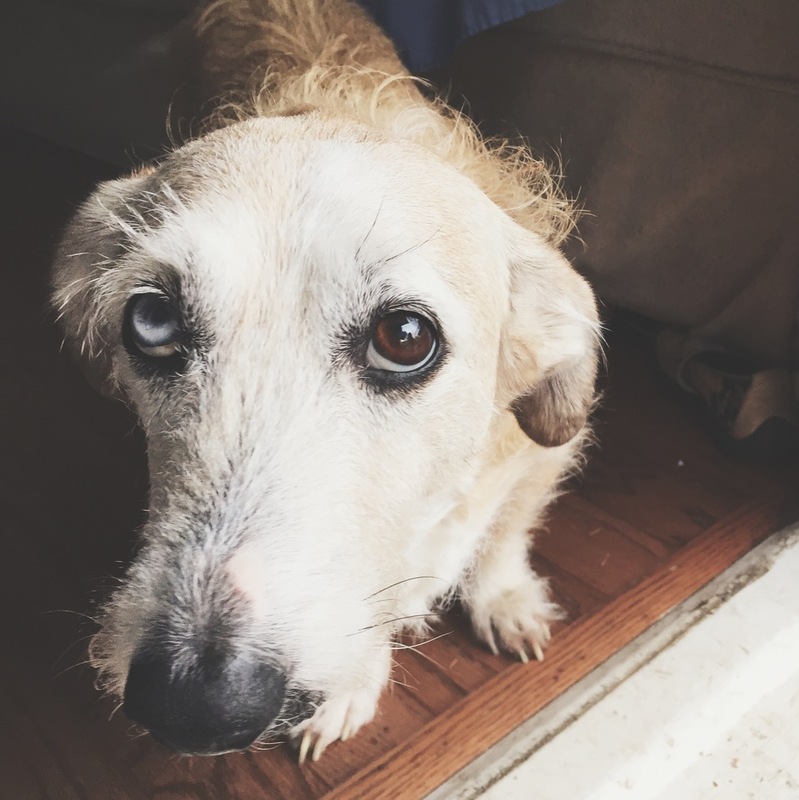 Of course there was personal growth (when isn't there?) and physical growth (my kids are weeds), but there was also so much plant growth. My mom and daughters grew a garden together. 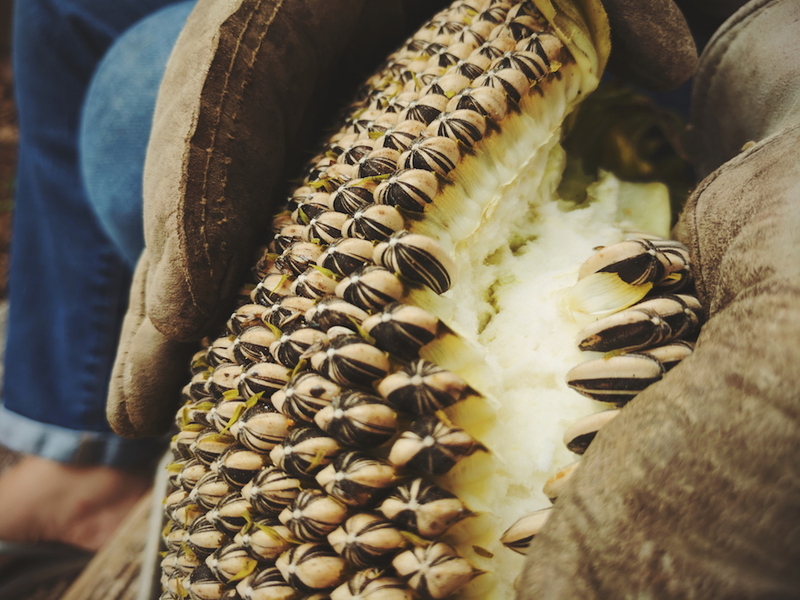 They grew corn, tomatoes and sunflowers. 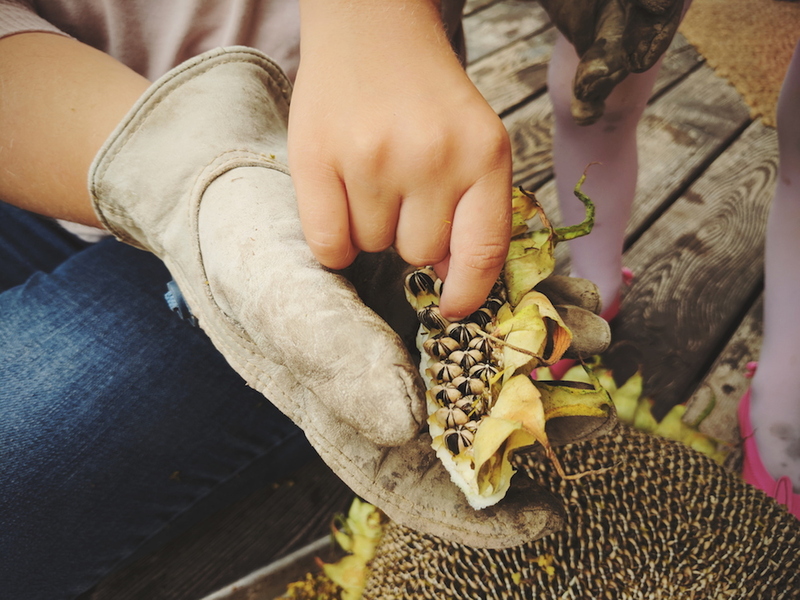 The corn and tomatoes were often ravaged by little creatures, but the sunflowers thrived, as did a passionfruit vine that was planted a few summers before. 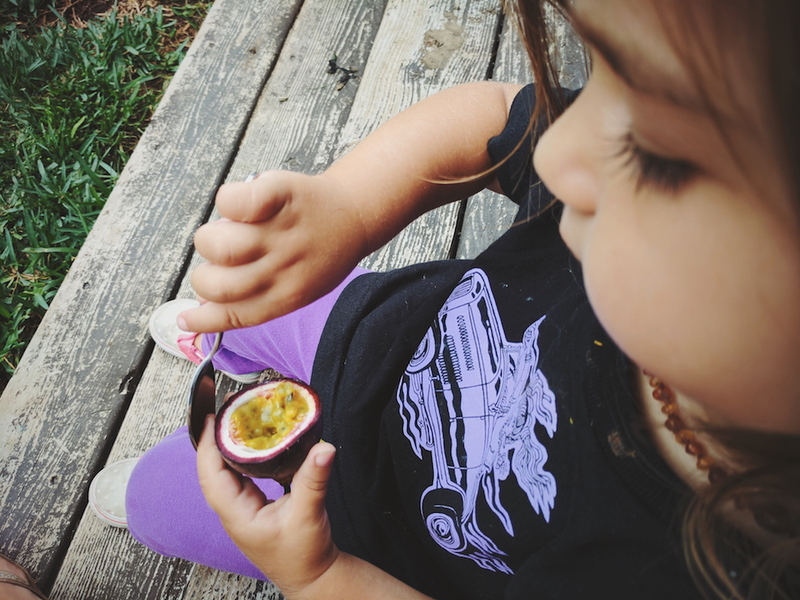 Isla loves passionfruit, as in she's obsessed. 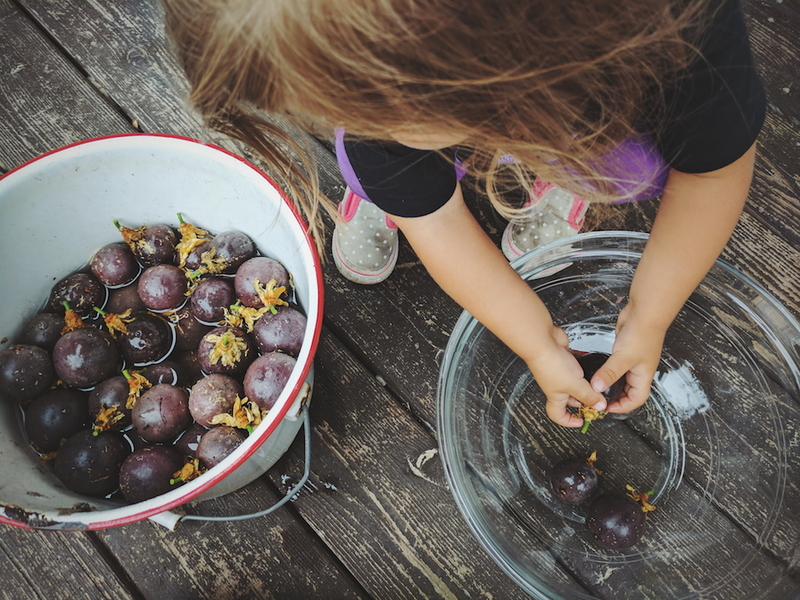 She wants to gather passionfruit every time we are at my parents' house and it has been a really sweet way for her and her papa to spend some awesome, nature-based quality time together. 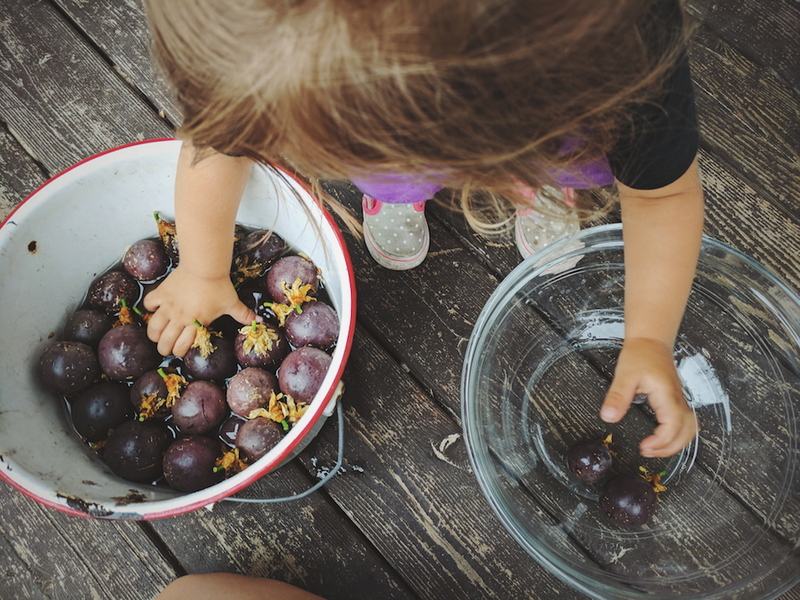 These photos are of her most recent harvesting adventure, which she began all on her own. In fact, she did everything on her own! It was one of the most wonderful things I've seen her do. 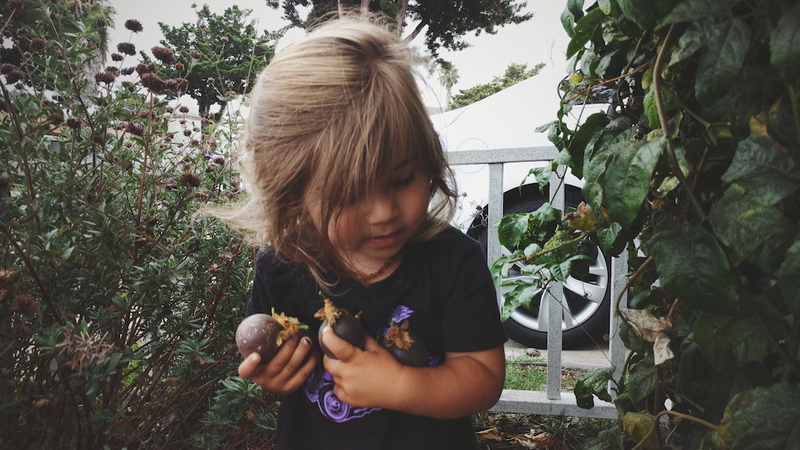 Lorelei loves all plants and vegetables and fruit. She enjoys gardening and getting dirty and muddy and sticky. Messes are her thing. She's fascinated, really. 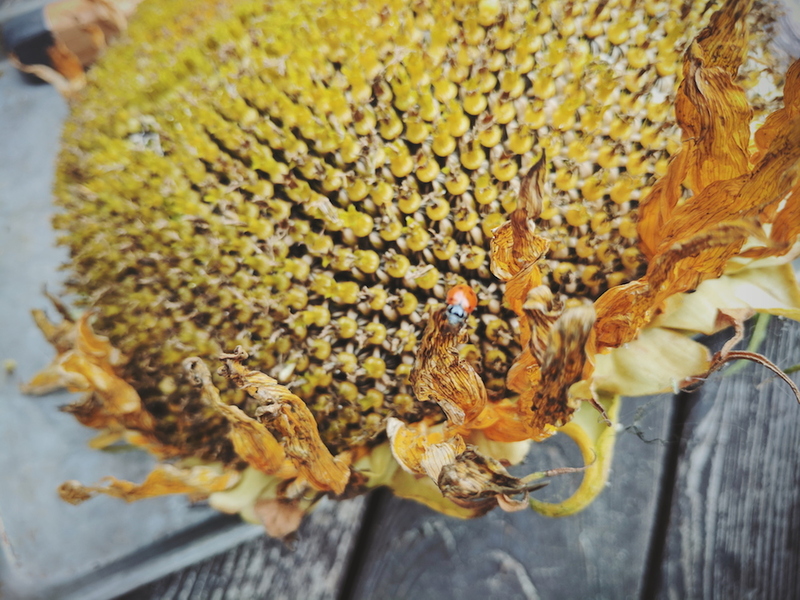 So feeling all of the sunflower seeds and observing the ladybugs crawling around them was a cool experience for her (and me). We all know I love nature and things that grown and bloom. That's why the photo of me holding some pups that I found on a walk is here. I got in on the harvesting action as well. Not gonna lie, I'm kinda hooked. Alas, here are some highlights of our summer harvest. 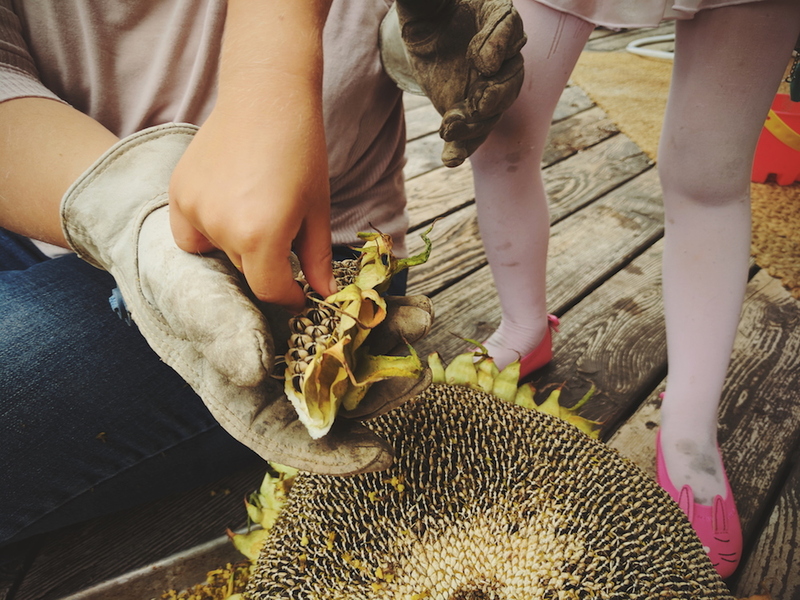 And if you've never harvested sunflower seeds before, I highly recommend it. There was a summer storm three days ago. It was unexpected, but much enjoyed. The weather was warm and humid and the skies were gray, then blue, then gray again. The rain poured, then drizzled, then stopped, then poured and drizzled again. And it was beautiful. Thank you, thank you, thank you! I hate being late, like, really hate it, so it was a total blessing that the universe aligned in such a way. Though I need this class to fulfill a certification requirement, I’d much rather attend it on time and without my squishy, giggly baby serving as a major distraction (no offense, Isla, you just make it really hard to focus). My mom and I took a look and were surprised to see that the caterpillar had transformed into a chrysalis when we weren’t looking. It was incredible to see, and we were all very excited. Lorelei was so excited, in fact, that she dragged her little red Adirondack chair over to the pot the chrysalis was attached to so she could sit and stare at it. Sadly, I had to tell her to get up out of the chair so that we could go home and hop in bed, but I reassured her that we would be able to watch the chrysalis for many days in the future. “Goodbye chrysalis, goodbye ant, goodbye little yellow bugs, goodbye plant,” she said, before following me to the car. Goodbyes are never easy. But, oh, how I wish we could have sat there as the sun set, and simply watched a transformation in progress without actually seeing the work going on behind the little green cylindrical wall of sorts. Nothing would have made me happier than to talk about caterpillars and butterflies with Lorelei while Isla listened and observed all the goings on. But a successful bedtime routine is all too valuable to me (Lorelei and Isla’s future moods depend on it), and it really was time to go. On that weird-weather day a few days forward, Lorelei spent a lot of time watching caterpillars shed their skins and form their chrysalides on YouTube. 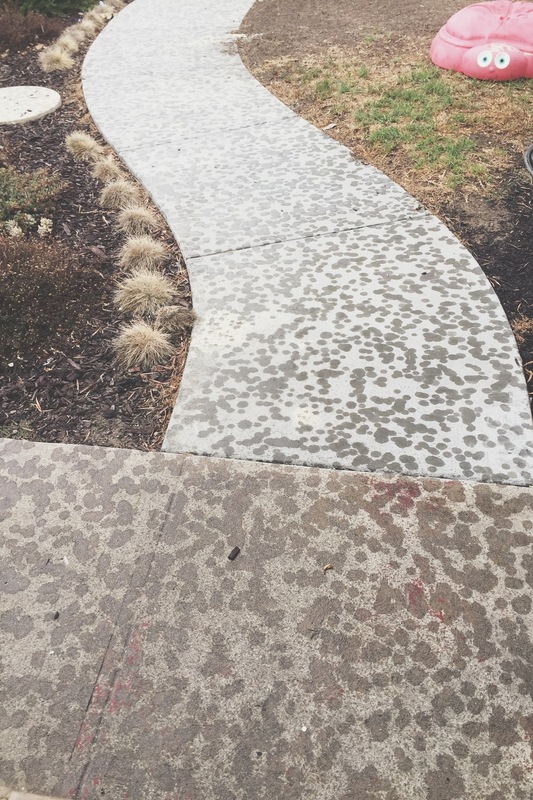 But when it began to rain, we hurried outside to admire the huge raindrops that were glittering the sidewalk. 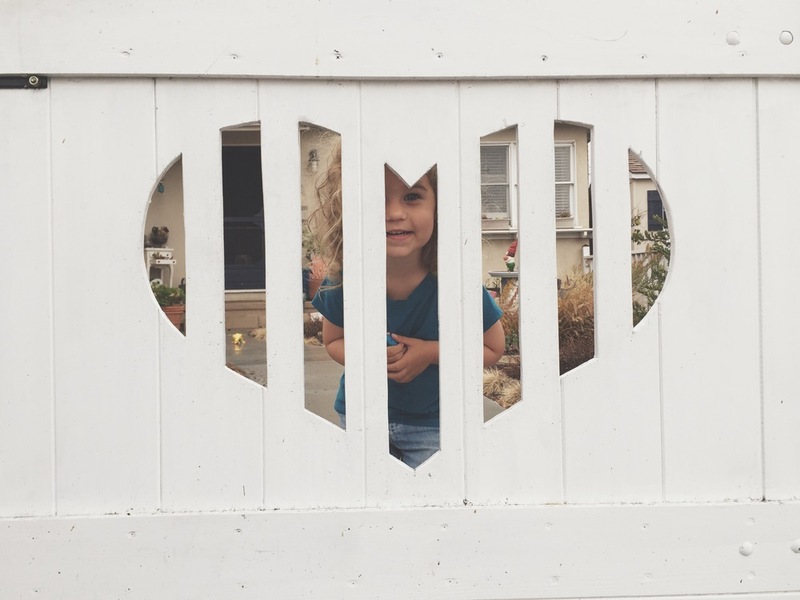 Lorelei isn’t able to see rain all that often, seeing as how California has been in a serious drought for her entire life thus far, so being able to really experience a storm was very exciting for her. It was warm as we stood on the porch with my parents and watched the rain splatter. 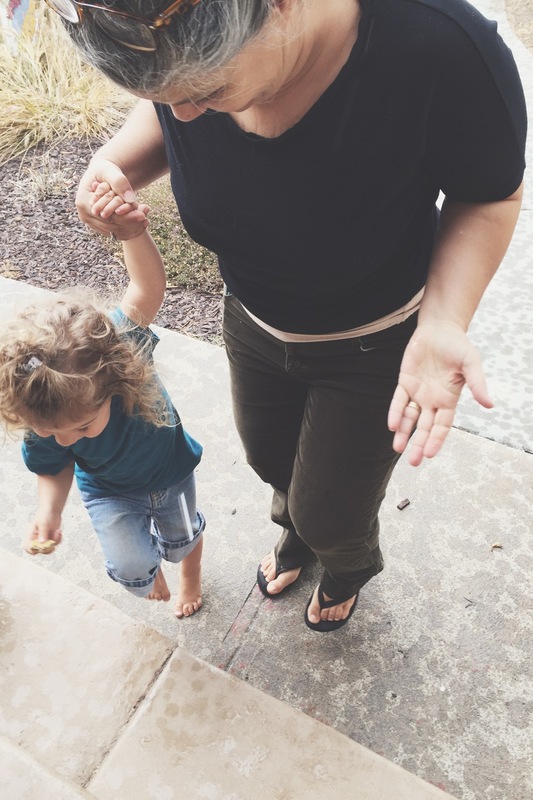 We guided Lorelei out onto the sidewalk so she could feel the heavy drops fall onto her skin, and we told her to stick her tongue out so she could drink some of the rain. After a little while, we went back inside and watched the rain stop and start again repeatedly out the window while kneeling on the couch. We eagerly listened to the thunder and told Lorelei that it was the sound that was made when the clouds bumped into each other. She liked the idea of that very much. Eventually the rain slowed down enough that we could go out and play without getting soaked. 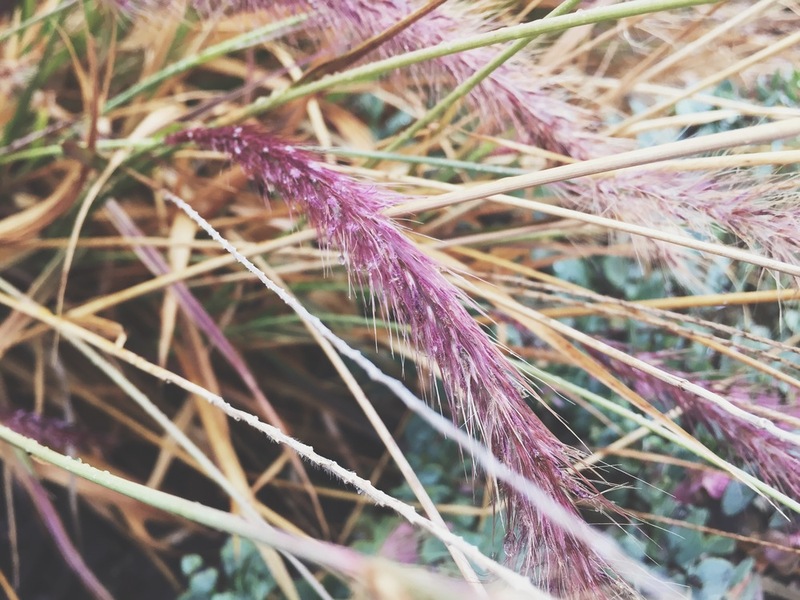 As I looked around the front yard, I could literally feel the pace steadying. My mind was working more slowly, I didn’t feel as anxious as I usually do, I was able to play with Lorelei without feeling like I was forgetting to do something time sensitive, I didn’t feel like I was starving (a common side effect of nursing every few hours), Baby Isla was sleeping and the vibe in the air was a very, very peaceful one. Water drops on flower petals caught my eye, and I felt extremely inspired to photograph all of the beauty that I was surrounded by in a yard that I walk through hurriedly almost every day. The next half hour or so was very reflective and enjoyable for me. 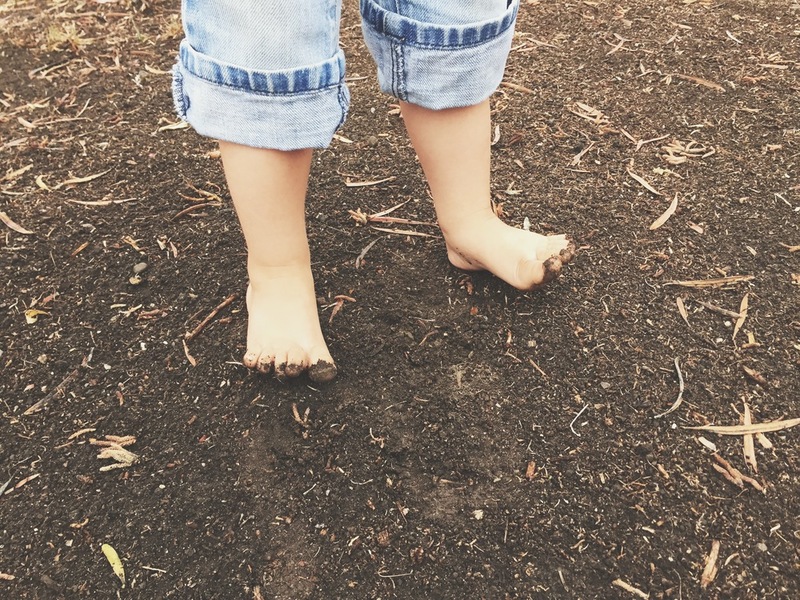 The air was still, Lorelei was beyond happy to be experiencing a different side of nature and I felt like my old, artistic self at the same time that I felt like a good mama. The combination of the two has never happened before, and this moment deserved to be remembered. After Isla woke up and it was time to go back inside, I continued to see beauty in the most ordinary of places, like the contrast of the stormy skies against the curtains in my parents’ bedroom, Lorelei's attempt at wearing lipstick, or the colors shared by Isla’s blanket and onesie. I snapped away like crazy without ever leaving the moment. It was unreal and amazing and gratifying to know that I had nowhere else to be and was allowed to simply be myself, and actually enjoy it fully. As the day came to an end and it was nearing the time to go home and help my girls go to sleep for the night, my mom and I both commented that the day in its entirety was actually really good. It never felt stressful, and everything that had happened that morning worked out for the best. We both love the rain, and I’m sure the change in weather was a much-needed change for our souls. I know that, for me, I was able to see my surroundings in a new light, and this ability allowed me to simply slow down and enjoy all of the mundane and ordinary parts of life that I never actually appreciate. I’m thankful for the many wonderful and beautiful moments of that day. And, I really miss the rain.